Editor’s note: Raihana is 29 years old and illiterate. She married at 15, has eight children, and works at home as a tailor to earn money to help her husband, who is from a poor family. Jalalabad — Gender difference in a family happens when families discriminate and give more rights to boys. They let boys get education. They prevent girls even from wearing the clothing they want and they discriminate in the food they give to boys and girls. They allow boys, but not girls, to select their future life partner. They ask boys if they want to choose a wife. For the girl, the family decides whom she will marry and she does not even know who the person is. I have many bad memories of gender discrimination. My family is one of the families who treat girls differently in everything. In our family girls cannot go to school but my lucky brothers can go. Many times in our family my rights and my mother’s rights have been taken away. I have been beaten many times by my father and my brother, even when I give them logical answers and I ask them why they must hit me. They believe in the nonsense talk in society and they think it is a stigma to the family if women participate in society. I think gender discrimination in Afghanistan is increasing, but it might be that now the press and media have gotten more active in broadcasting cases of violence and discrimination. The security situation is not good, so people in the far districts and villages don’t have any awareness about the rights of women. The government should provide some courses for illiterate men and women to learn about it. The government should take steps to punish people who do violence. The men can be taught about this at the mosques, because they believe in Islam and the Qur’an. They need to know that we have equal rights. My message to other girls is that we should stand together against this problem. 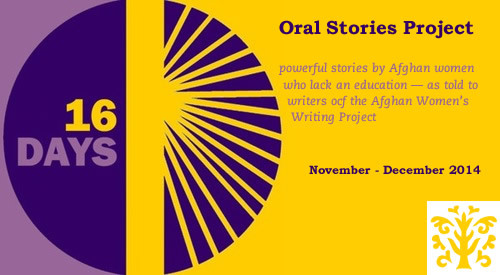 Raihana was interviewed for AWWP’s Oral Stories Project as part of the Sixteen Days Of Activism Against Gender Violence global campaign.